Hertha Berlin are clearly enjoying having Marko Grujic a part of their squad – at the least the social media administrator is! Following a run of good performances in Germany, the Serbian international was the subject of a meme posted by the German club’s English Twitter account. It seems common practice now for football clubs to be more casual on social media – a trend arguably accelerated by the success of AS Roma’s English language Twitter account which has over 400,000 followers. Grujic has managed three goals and a solo assist in 14 appearances in the Bundesliga this season and he’s impressed in Germany – most recently he scored against Jurgen Klopp’s former club Mainz in a 2-1 victory for Hertha Berlin. The Liverpool man has been nominated for the Bundesliga’s Rookie of the Month award – an award given to players aged 23 or under. Other nominees for February include Eintracht Frankfurt’s Evan N’Dicka and Red Bull Leipzig’s Tyler Adams. 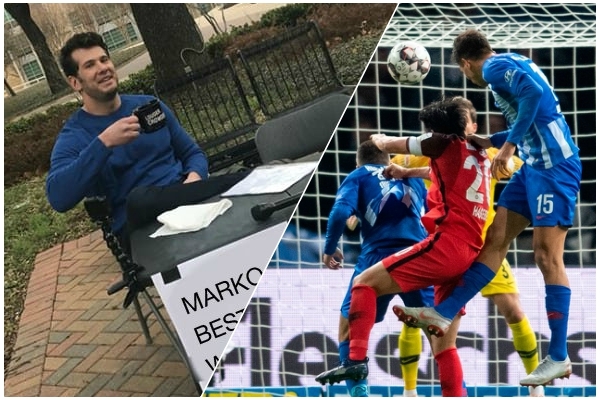 We’re not sure about him being the best midfielder in the world but coach Pal Dardai told the Bundesliga’s official website: “This isn’t meant as an insult to anyone else, but Marko is by far the best midfielder I’ve seen in my time at the club. Certainly high praise for the Serbian – Dardai played for Hertha Berlin for 14 years – winning the German League Cup and Intertoto Cup – and has been part of the coaching staff for seven years. But will Grujic return to Anfield as a genuine option for Jurgen Klopp? Or will he simply be offloaded for a sizeable sum?